The new mid-range Effer 205 model truck mounted crane is a high performing tool for the construction and building sector. Operators can load and unload materials with impressive operative efficiency, giving you the competitive edge. This means that you can have a crane able to work in an easy, effective and safe way in building sites, making more operations thanks to its working speed. Sitting in the 20txm lifting range, the 205 model is made more efficient thanks to its slewing ring system for continuous rotation, a plus in case of rear installation on the truck with a trailer. The 205 model also comes with Effer’s DMU 3000 PLUS electronic management system. The DMU 3000 PLUS control not just crane functions, but other truck electronic functions as well including switching the truck on/off from the remote control, and it memorises crane operating cycles and updates you on scheduled maintenance. 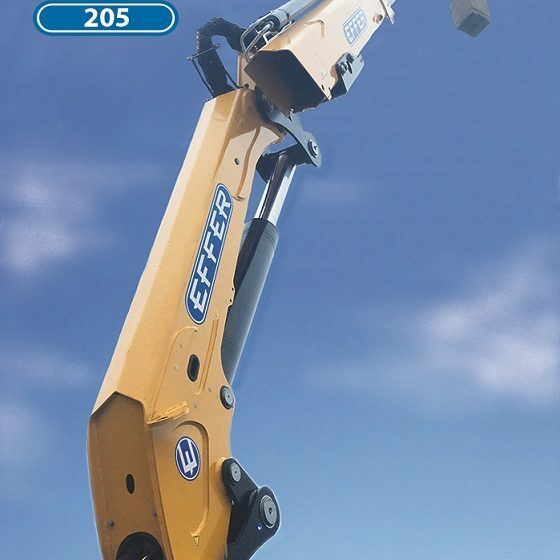 Owing to its high-strength steel structure, the Effer 205 is a very light and compact crane but made for hard work. It is not only reliable but able to carry out different works in combination with different accessories such as buckets, grab, brick grab, jib, etc. It has also been designed with the double link-rod system, which allows the operator to work at full power both in horizontal and vertical boom positions. To save time in mounting and demounting the jib or other accessories on the crane, the Effer 205 can be fitted with the Quickfaster device, allowing you to connect all the hoses in one time. Click here to view the entire range of Effer crane’s. For more information contact the expert team at Cranetech.